Nothing can ruin a trip for you and your dog more than having a canine medical emergency when you’re far from home. 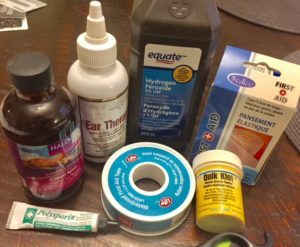 Over the years we’ve learned through experience, and a good pet first aid class I took a few years ago, that it could be helpful to have some basic knowledge and a few supplies handy in case of emergencies. During a recent trip to our cottage four hours from home one of our younger dogs got into trouble via a container of cocoa powder. I thought taking ingredients to make Nanaimo bars at the cottage was a great idea — boy was I wrong! I hadn’t even made the pan of squares when Autumn decided powdered cocoa was irresistible. I had packed the powdered baking cocoa in a plastic container and left it in a tote box full of dry goods in the kitchen, about three feet off the floor. Little did I realize the power chocolate had over a dog with a great sense of smell. 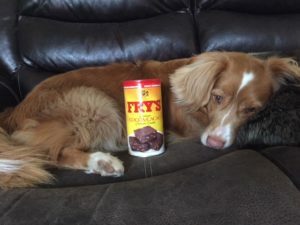 Many dogs would not give powdered cocoa more than a passing glance, but Tollers are known for being gluttons and devouring anything that smells good. Loaves of bread are another item Autumn has enjoyed far too many times. Usually we monitor the dogs very closely but one day when we went out for a short trip to the store Autumn sought out the tub of cocoa and dragged it into the TV room where she managed to get the lid off and spread the cocoa all over the floor and sofa cushions. Autumn is fine now (she’s just a little sleepy here) but when she ate some cocoa powder on a recent trip the cottage we had to induce vomiting and consult a vet’s care. As many will know, chocolate can be highly toxic to dogs. Dark chocolate and cocoa powder is considered most dangerous. Luckily, we estimated she had ingested the cocoa very recently but it was hard to know how much based on how much was spread all over the couch and floor and what was left in the tub. The dog should vomit within the next 15 to 20 minutes, aided by walking them around. She didn’t like the process at all, but it worked! It’s also important to keep the time frame of consumption in mind. If it’s been two hours since the dog ingested the offending toxin it can be too dangerous to induce vomiting, or, if your pet has already started vomiting do not try to induce vomiting. After Autumn had vomited several times, to be on the safe side we also took her to the vet, about a half hour away from our cottage, where she was given activated charcoal to induce further vomiting. She was fine and went on to be perfectly fine within a couple of hours, but having the peroxide in the first aid kit was a good first response to address the issue immediately. We had called ahead to the vet to consult about the use of peroxide and to see if they were open. We have used Blue Sky Animal Hospital in North Bay more than once before so knew they would be great. One thing we have learned from past experiences is that having a list of vets in the area where you will be travelling is extremely helpful in addition to any information on any emergency clinics. In some small communities where emergency vet clinics do not operate, vets often share in taking on weekend “on-call” duties. I’ve spent a good amount of time some weekends calling around to clinics to see who is open. By checking out a few clinics ahead of time you can head out on your trip armed with that information, especially on holiday long weekends when many are not open. 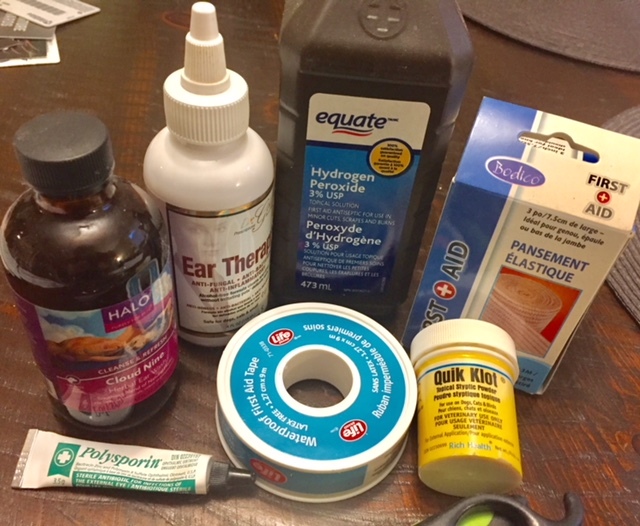 In addition to hydrogen peroxide being a great item to have on hand for dogs and humans for minor first aid applications, it’s good to also have packed a kit of other items. You can purchase pet first aid kits from pet stores and some animal welfare organizations — St. John Ambulance sells a good one for about $40. or make up your own with products from the drug store, pet stores or dollar store. Some items to have in your travel pet first aid kit include medical tape, hydrogen peroxide, an elastic bandage, clotting powder for toenails that may become ripped, an ear cleaning solution and antiseptic ointment. It’s also a good idea to pack copies of any pertinent medical/vaccination records and medications for your pet. It’s also good to have it handy if you need to visit an emergency clinic.